The Opera Guild assists local voice students, both undergraduate and graduate, with scholarships, grants, competitive prizes, and opportunities to perform for the community. OGSA previews Arizona Opera’s production of The Marriage of Figaro April 1 in Oro Valley and April 5 in Tucson. Past president Carol Garrard considers the socio-political background of the opera and the play it is based on. When Lincoln met Harriet Beecher Stowe, the author of Uncle Tom’s Cabin, he said, “So you are the little lady who made this great war.” And indeed, her book did play a role in marshaling Northern opinion against slavery. But how many Americans know about the role the French author Pierre-Augustin Beaumarchais played in the role of helping the infant United States in their revolution against the British King George III? And even more astonishing, how many know the role his play, The Marriage of Figaro had in setting off the French Revolution which would not only topple the French monarchy but send King Louis XVI and his queen Marie Antoinette to the guillotine? Napoleon came to describe The Marriage of Figaro as “the Revolution already in action.” But was he referring to Beaumarchais’ play or Mozart’s opera? Exploring the answer takes us on a fascinating journey: where art ends, and history begins. Arizona Opera’s recent production prompts Carol Garrard to look beyond the fairy tale to historical events that likely inspired the composer and librettist. The Metropolitan’s production of Rusalka will be live in movie theaters on February 25. ​In this age when opera directors feel free to impose their own “concept” on the work, it is delightful to see Joshua Borths’ sensitive staging of Rusalka penetrate to the core of this beautiful but puzzling opera. As we know, at the denouement, the Prince asks Rusalka for the kiss which will end his life. She gives it, knowing that the kiss condemns her to being one of the water beings who lure men to their death for eternity. However beautiful her last aria, the audience is left to wonder about a murder/suicide which brings down the curtain. Rusalka: Not your Disney Mermaid! OGSA’s president Carol Garrard gives the story of Dvořák’s dark fairy-tale opera, which we are previewing on November 9 and 11, 2016. If you took your children or grandchildren to Walt Disney’s “The Little Mermaid” and are hoping to replicate that experience with more elegant singing—well, Rusalka is not the opera for you. The ninth of Antonín Dvořák’s ten operas, it alone has entered the repertoire. 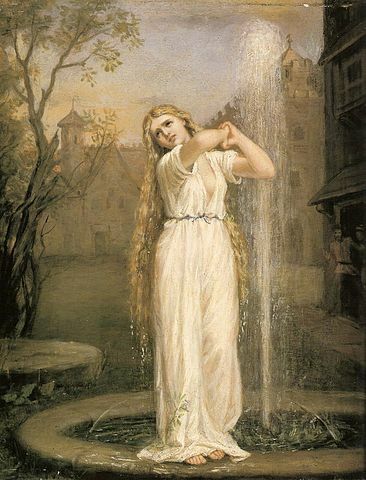 It contains one of opera’s greatest hits, Rusalka’s beautiful Act I “Song to the Moon,” with its haunting glissando string motif. There is a great deal of other beautiful music in this fairy tale made into opera, but its ending of doom for both the eponymous heroine and her lover is dark indeed. Rusalka is based on Czech and German folk tales that have often ‘surfaced’ in literature, opera and ballet. 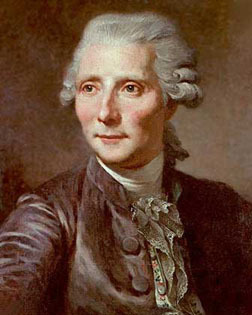 A notable example is the novella Undine, by Friedrich de la Motte Fouqué. (See the illustration at right by J.W. Waterhouse.) In Fouqué’s story the water nymph gets her legs, and she gets her man too. Yes, he betrays her, but they are reunited in love, and as the curtain goes down, they die in each other’s arms. OGSA’s once and future president Carol Garrard considers Verdi’s farewell gift to the world, his comic masterpiece Falstaff, which we are previewing on March 25 and 30, 2016. The last notes of Falstaff. All is finished! Go, go, old John… Walk on your way as long as you can… amusing type of rogue eternally true, beneath different masks, in every time, in every place! Go, walk, walk, farewell! You probably know that Bizet’s tragic heroine was Spanish, hailing from Seville. But historian and OGSA past president Carol Garrard traces the story back to a poem by Alexander Pushkin, whose works inspired many operas. Along the way she imagines how the Arizona Daily Star would have treated the tale if Carmen were a contemporary Tucsonan, and answers the question, “What does Carmen want, anyway?” Read the full engrossing article, and don’t miss Arizona Opera’s production of Carmen January 30 and 31. Entire contents © 2019 by Opera Guild of Southern Arizona, Inc. Please contact webmaster@azogsa.org with questions or comments on this site.